I sometimes entertain myself by reading the liner notes on old vinyl records. This isn't liner notes, but I found this stuff on the cover of "Another Side of Bob Dylan," (1964). Stereo "360 Sound." Playable on mono equipment. For best results use stereo needle. New York Times: "Swedish Bank Move Creates a Global Shudder"
David Beckworth: "China's Coming Devaluation: Another Consequence of the Fed's Mistake of 2015"
Market Watch: "Is this the week central banks lost their market credibility?" Zerohedge: "This is What Central Bank Failure Looks Like"
Scott Sumner: "Another Sign of Fed Incompetence"
The economy continues to strengthen but inflation is expected to be lower during 2016 than previously forecast. The period of low inflation will therefore be longer. This increases the risk of weakening confidence in the inflation target and of inflation not rising towards the target as expected. To provide support for inflation so that it rises and stabilises around 2 per cent in 2017, the Executive Board of the Riksbank has therefore decided to cut the repo rate by 0.15 percentage points to −0.50 per cent. Purchases of government bonds will continue for the first six months of this year, in accordance with the plan adopted in October. The Executive Board has also decided to reinvest maturities and coupons from the government bond portfolio until further notice. There is still a high level of preparedness to make monetary policy even more expansionary if this is needed to safeguard the inflation target. This is a very familiar story in many countries, including the U.S. Inflation is not increasing as the central bank had been anticipating, and in the Riksbank's case a decision has been made to take corrective action. That corrective action is more of the same - pushing the policy rate further into negative territory, and conducting further quantitative easing. As well, there is forward guidance: the Riksbank will do even more of the same if they don't get results. Basically, the Riksbank believes in its Phillips curve. For it, lower unemployment means higher inflation and, presumably, it thinks a lower nominal interest rate will further reduce unemployment and increase inflation. So, that's a fairly typical view. Central banks experiencing low inflation are typically the ones who have done the most to put unconventional policies into practice - negative nominal interest rates and quantitative easing in particular. Most of the people currently calling the Fed stupid are orthodox types. They have a Phillips curve view of the world, and they think of low nominal interest rates as "accommodative." And orthodox central banking views breed a "whatever it takes" set of actions - negative nominal interest rates, quantitative easing - in an attempt, as they see it, to get inflation back to target. The more important point, though, is that no one really knows what is going on with monetary policy right now. No one knows what the Fed is really trying to accomplish, or what it can accomplish, or how to go about accomplishing it. Is it still set on raising interest rates in order to avoid the semblance of abnormality from keeping them close to zero? Is it worried about demand-side shocks from China’s slowdown? Does it want the public to think that it will never let inflation go above 2 percent, or does it want us to think that 2 percent is in the middle of the acceptable range? Is it trying to raise inflation and failing? And if it did want to raise inflation to 2 percent, would it do so by keeping interest rates low, or by raising them? It’s becoming clearer that the Fed's experiments during the Great Recession, dramatic as they were, taught us little about how monetary policy works. Now I'm puzzled. Noah is a guy who loves experiments and empirical work, and thinks every econ 101 student should spend a lot of time staring at data. In the last 9 years, we have had a major financial economic event, coupled with major central bank crisis intervention, followed by an unusual recovery, sovereign debt crises, and many central banks experimenting with unconventional policy. But "us" did not learn anything. Go figure. Here's something I've learned since the financial crisis. There's a paper by Benhabib, Schmitt-Grohe, and Uribe (BSU), "The Perils of Taylor Rules," that shows how an aggressive Taylor-rule central banker inevitably converges to the zero lower bound, and gets stuck there. A central banker following a Taylor rule sets a target for a short-term nominal interest rate, and increases that target interest rate if the inflation rate increases relative to its target level. Typically, Taylor rules include a term for the "output gap," but the argument doesn't depend on that. Basically, a typical Taylor rule embeds orthodox central banking - increasing the nominal interest rate should make the inflation rate go down. Further, an aggressive central banker is one who follows the "Taylor principle" - if the inflation rate increases relative to its target, then the nominal interest rate should go up more than one-for-one. Why? Again, that's part of orthodox central bank thinking. If the nominal interest rate increases more than one-for-one with an increase in the inflation rate, the real interest rate should go up in the short run, real economic activity should go down, and by orthodox Phillips curve logic, the inflation rate should fall. But, if you work through BSU, you'll see that this results in many dynamic paths that end up at the zero lower bound (ZLB) for the nominal interest rate, which is a steady state. Once there, the orthodox central banker is stuck. Inflation stays below target, as there's nothing to make it go up, but the orthodox central banker is convinced that a lower nominal interest rate is what's needed to increase the inflation rate, and gets increasingly frustrated. Some people can see these things right away, but I usually have to work it out myself to understand it. I wrote this paper with David Andolfatto, which adds some stuff to BSU, including a scarcity of safe assets and low real interest rates. If you understand BSU, it's only a short step to understanding the current behavior of central bankers. Frustrated by what they see as a ZLB problem, orthodox central bankers find other ways to be "accommodative." If you think about it a bit, or talk to Miles Kimball, you'll understand that zero isn't really a lower bond for the nominal interest rate - the orthodox central banker can go negative, as the Bank of Japan, the Danish central bank, the ECB, the Swiss National Bank, and the Swedish Riksbank have done. He or she can engage in quantitative easing (QE) - central bank purchases of various long-maturity assets, as the Fed, the Bank of England, the Swedish Riksbank, the Swiss National Bank, and the Bank of Japan have done. The orthodox central banker can also make promises about the future, in the hope that those promises are believed, and will have some effect today. And, the central banker who does not do those things, does them and stops, or doesn't do "all it takes," will find plenty of people willing to call him or her stupid (see the links at the beginning of this post, or see Narayana's web page). So, if you read BSU and thought that it would be easy for a central banker to get out of the low-inflation, low-nominal-interest-rate trap, better think again. It's useful to include Japan here, as it's been in the trap since about 1995, with low interest rates, and inflation averaging about zero. 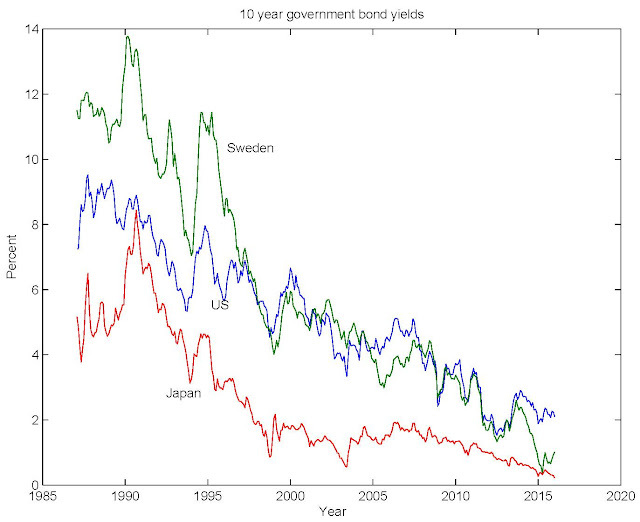 As is well-known, the real interest rate, according to various measures, has fallen over this period, but you can see a "convergence to Japan" here - everyone's falling into the trap, and you can see the same thing if you look at government bond yields for other countries. 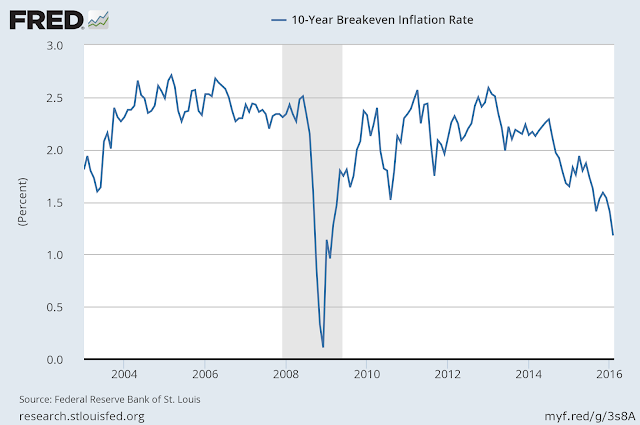 The current 10-year breakeven rate is low, at 1.18%, relative to any period in the time series, excepting the financial crisis, a period during which bond yields were reflecting various market liquidity factors rather than inflation premia. So that's ominous, and the reaction of a committed orthodox central banker is to just dig a deeper hole, as reflected in the Riksbank's statement earlier in this post. Lower measured anticipated inflation is just like lower actual inflation - it means greater frustration on the part of the orthodox central banker, and he or she wants to go more negative, and buy more assets, cheered on by various Kimballs, Kocherlakotas, etc. What are the lessons for people outside central banks? 1. If you live in Sweden, for example, don't pay any attention to the Riksbank's forecasts. Pay attention to what the Riksbank says. Inflation is actually going to stay low - zero for a long time would be a good forecast I think - and the Riksbank is trapped in the hole that it dug for itself. 2. If the central bank starts using words like "Fisher effect," pay attention. This central bank means business. 3. Once stuck at the ZLB or ELB, there's nothing for the central bank to do. That's what I mean by "the end of central banking." Central banks can purchase all the assets they want - that's not important. What matters is the central bank's nominal interest rate policy target, and the rule for setting it. 4. Beware of other "tools" that people might think up. A recent one is "helicopter drops." More about that later. 5. Beware of changes in central bank objectives masquerading as changes in tools - e.g. nominal GDP targeting, price level targeting, or a higher inflation targets (4% for example). It's typically an orthodox economist or central banker projecting those ideas, which will similarly imply a path to ELB, or sticking there, if that state has already been attained. 6. Don't panic. Zero or negative inflation actually is OK. If someone tries to tell you about the black hole of deflation, plug your ears and start humming. 7. What is not OK is for people to continue to anticipate 2% inflation that a central bank promising but incapable of delivering. Again, for long-range planning purposes, think zero inflation indefinitely. 8. If you're an economist, pay attention to what your models are actually predicting, unless your model is straightforward IS/LM - Phillips curve. In that case, you need to learn some more economics. Standard off-the-shelf monetary models essentially all exhibit a neo-Fisherian effect. That's nothing special. The Fisher effect is important. Typically increases in nominal interest rates lead to increases in inflation. Orthodox people - particularly the ones with some technical facility - can think up examples where they think this doesn't happen. Don't buy it though. If they persist, you can always plug your ears and start humming. 9. For a non-interventionist, the low-inflation policy trap is a wonderful thing (John Cochrane, for example, seems to be fine with it). The interventionist orthodox central banker, in the process of trying to "do all it takes," sows the seeds of his or her own destruction, and becomes powerless. No high inflation, no hyperinflation, only low inflation - and inflation might be fairly stable. In the course of committing policy hara kiri, the orthodox central banker imposes some transition costs, but the steady state ain't so bad. So, if you're confused, worried, or feeling like you haven't learned anything about how monetary policy works, there's no good reason for that. Cheer up. We are very conscious, and wish interest rates could go up again, but this is not the case now. I don’t think anybody is thinking about changing policies, but if we were to change, it will lengthen the timing of inflation reaching 2%. Comments on "The Potential Power of Negative Nominal Interest Rates"
Here are some comments on Narayana Kocherlakota's "The Potential Power of Negative Nominal Interest Rates." Negative nominal interest rates allow a central bank to achieve lower real interest rates, without raising inflation expectations. 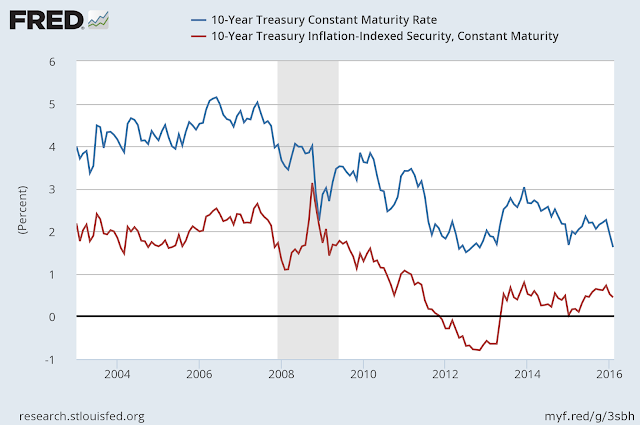 So, negative nominal interest rates lower inflation expectations. Agreed. ...a negative nominal interest rate gives more policy space to the central bank. It has much the same benefits as raising the inflation target, without the costs associated with higher inflation. As I pointed out here, Narayana is actually a neo-Fisherian; he just hasn't come to terms with it. He understands that, on average, a higher inflation target requires a higher nominal interest rate. Actually, more correctly stated, the impact of policy depends on how the public understands the central bank's policy rule. So, the central bank might want the public to understand that negative nominal interest rates won't happen often (it's an emergency setting, or it depends on very low real interest rates, etc.). That's quite legitimate, and just gives everyone a better understanding of what the central bank is up to. Here’s the right way to communicate: keep saying that all available tools, including negative interest rates, will be used as is needed to return employment and inflation to desirable levels as rapidly as possible. That's the crux of the problem. Negative interest rates will in fact not lead to a return of employment and inflation to desirable levels in a rapid fashion, under some conditions. As I pointed out in my last post, the Swedish Riksbank, the central bank of Denmark, the Swiss National Bank, and the ECB, have all gone negative, and they have not been returning inflation rapidly to their 2% targets - in same cases they are getting further away, and it's not hard to see why.